Blast Off is a fun game. If they answer the question correctly they get to play the Blast Off game. 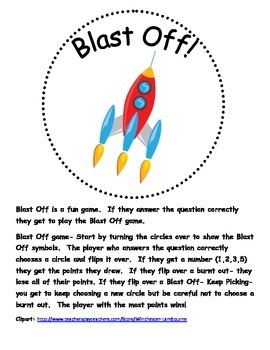 Blast Off game- Start by turning the circles over to show the Blast Off symbols. The player who answers the question correctly chooses a circle and flips it over. 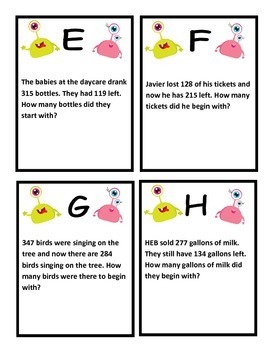 If they get a number (1,2,3,5) they get the points they drew. If they flip over a burnt out- they lose all of their points. If they flip over a Blast Off- Keep Picking- you get to keep choosing a new circle but be careful not to choose a burnt out. The player with the most points wins! 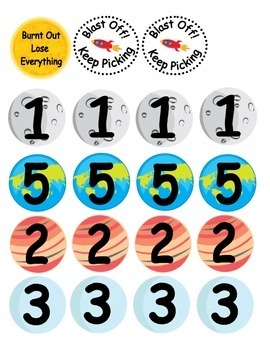 Set up: Print on tag board, glue together a blast off circle to the back of a planet/sun/moon , laminate all pieces. and cut out alien cards and glue the answers on the back (answers provided). 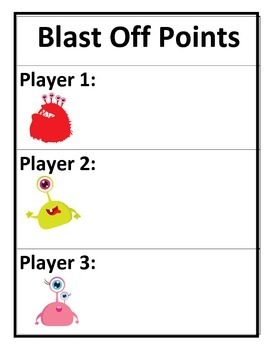 If you have a poster machine print the last page the black blast off board. If you do not you can create your own blast off board with black poster board and moon and stars die cuts.